One of the delightful aspects of my current role at U of Toronto as Assistant Professor, Teaching Stream and Director of Graduate Professional Development, are the stories I hear from many graduate students about the impactful work they lead in and out of science. We mostly hear about these stories through their seminar presentations, posters, publications and award/scholarship announcements. However, what we often do not hear about are the personal leadership and impact stories which are not showcased on the traditional academic stages. Through a new series of articles called Changemakers, I hope we can share these stories to inspire others and highlight the impact stories of our students, faculty, staff, alumni and colleagues. I hope as we move forward, more of these stories will be featured as single entries, but I will open our inaugural piece with a few acknowledgements which I wanted to showcase. All of these changemakers are graduate students with some of their names changed as they wanted to remain anonymous. Hudson started to volunteer at a hospital and realized the benefits of the weekly, live music program for patients. But he noticed something. Some patients were bedridden and could not easily move to the performances in the main lobby. So he decided to invite some of his music friends to bring the music inside the patients’ rooms, who wished to hear music. He organized the program to host live music every other week for multiple years. Anna and her a’cappella group volunteer to perform holiday songs for patients. One elderly lady asked her if the group could sing “White Christmas.” Although they had not practiced that song, Anna had remembered the words and her friends chimed in with harmony. The teardrop on the lady’s face moved them to sing with even more spirit. Linda, our colleague from the Immunology department, was volunteering at a hospital and noticed some patients needed a little extra attention as they were waiting for their treatments. She and her friends began to fold origami and donated their creations to the hospital. Their initiative grew into an origami fundraising group raising over $2000 for the hospital by sharing origami expertise to staff, parents, and children. They also established a collaborative volunteer program with the hospital, so that more U of Toronto students could participate in this origami initiative and gain hospital volunteer experience at the same time. Walking along winter’s -20C streets of Toronto, Nero notices a homeless man…without a coat. Nero was inspired with his friend Noah to start a coat drive which has provided warmth to Toronto’s homeless population. A high school boy decides to forego university as he thinks he does not have what it takes. Tomas tutors him once a week pro bono and inspires him to be accepted into college and university. Josh volunteers his time and scholarship for an organization to help mentor school children. Simoun helped organize and raised thousands of dollars to help with Syrian refugees. Taylor has led fundraising drives for projects to help the homeless. All of these graduate students have gone above and beyond to help society. These are our future scientific leaders who also possess “heart,” the human factor which the world needs more of. None of these students initiated these projects to be recognized, or to win an award, or showcase it on their CV. They did these things because they care. 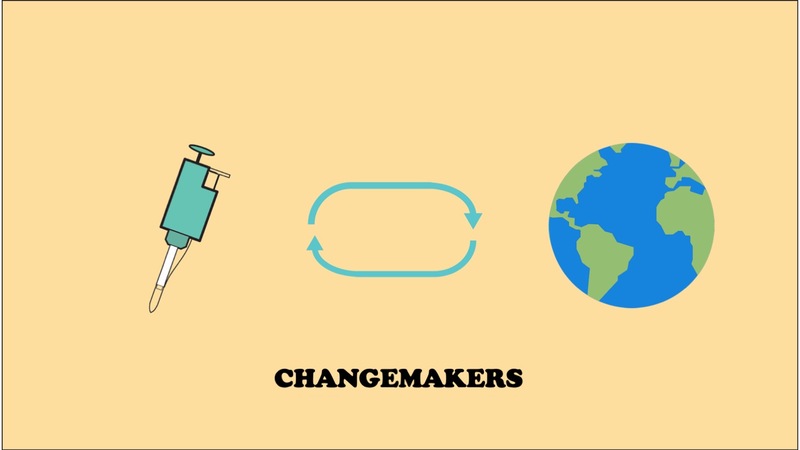 From the bottom of my heart, changemakers, thank-you for bringing meaningful engagement to life alongside your scientific pursuits. It is a privilege to work with you. Also, a special thank you to the changemakers who help shape the graduate experience with their leadership in our student councils and groups for mentorship, communications, teaching, leadership and professional development. You know who you are – keep impacting!